Apple on Tuesday was granted a patent for an ultrasound-based force and touch sensor that could lead to a thinner, less obstructive 3D Touch mechanism, a structure which was reportedly a barrier to below-screen Touch ID integration in iPhone X. As granted by the U.S. Patent and Trademark Office, Apple's U.S. Patent No. 9,772,721 for "Ultrasound-based force sensing and touch sensing" details a method of determining input force by emitting and detecting ultrasonic pulses. More specifically, the system measures the interaction between said pulses and a user's finger. In some embodiments, force sensors are disposed as ultrasonic elements arranged in rows and columns, or alternatively an array of individual sensors arranged in any desired pattern, to generate and receive ultrasound waves. A first ultrasound wave is directed at an area where a user's finger might touch the screen or engagement surface. Waves or pulses travel through components, like a sensing layer and input surface, to be reflected by a portion of a user's finger or other object in contact with the substrate. 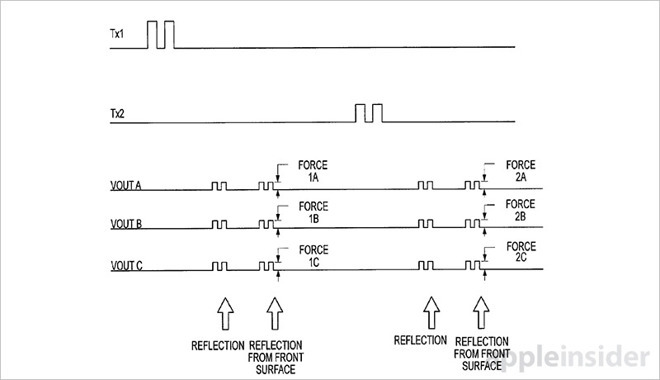 The reflection of the pulse may be used to determine the distance between the input object and the sensor, which can then be used to calculate force. Attenuation, or the amount of pulse signal absorbed by a contacting object, can also be used to determine force magnitude. For example, when a finger presses harder on a screen, its surface area increases and thus absorbs a larger percentage of the pulse. This data can be applied to augment detected force input calculations. Apple's patent notes the force sensor array works in concert with other sensing mechanisms like a capacitive touch sensor, which might also double as a reflection surface. In addition to determining a given input's location, the capacitive layer may also be utilized in detecting force metrics for multiple separate, simultaneous inputs. Importantly, the force sensing apparatus can be disposed below a device display or above it. For example, if ultrasonic sensors were placed over presentation elements, they could be made transparent or constructed and arranged so as not to impact a user's view of the screen. This method is a departure from Apple's current force sensing iPhone system, dubbed 3D Touch, which stacks multiple component layers beneath the smartphone's display. The existing 3D Touch system is capable of measuring and mapping small changes in capacitance between iPhone's cover glass and a rigid metal sensor layer embedded in the device's backlight array. When a user presses down on the cover glass, the distance between it and the sensor decreases, thereby resulting in reduced capacitance. 3D Touch is helped along by a separate multitouch capacitive sensor layered above the display. This sensor determines finger location during touch and, when detected, force gestures. Completing the package is the Taptic Engine, a haptic feedback module that generates precise vibrations. While 3D Touch yields highly accurate results, its design is complex and construction eats up valuable internal device space. This latter consideration plays into iPhone X and Apple's rumored failure to integrate a sub-screen fingerprint recognition system meant to replace Touch ID. Scuttlebutt circulating in the lead-up to this month's iPhone X unveiling suggested Apple would retain its fingerprint reader as a backup or alternative authentication method to a new facial recognition solution. As is now known, the company scrapped Touch ID altogether, moving instead to the depth-sensing Face ID system. Some industry analysts speculated Apple arrived at its decision to ditch embedded Touch ID only after facing insurmountable difficulties related to the 3D Touch stack. Insiders, however, claim the company has been all-in on Face ID for over a year. Also unknown is whether Apple integrated legacy 3D Touch technology into iPhone X or opted for a redesigned solution. Reports in May claimed the company was moving to a thin film process that does away with the metal backlight sensor in favor of a film-on-glass design, substantially cutting down on sensor stack size. A teardown will likely reveal more answers come November. In any case, the patent granted today could be a solution to technical troubles that supposedly thwarted under-screen Touch ID in iPhone X, and appears to be more accurate and robust than thin film options. Whether Apple plans to take advantage of the technology, or continue full steam ahead with Face ID, remains to be seen. 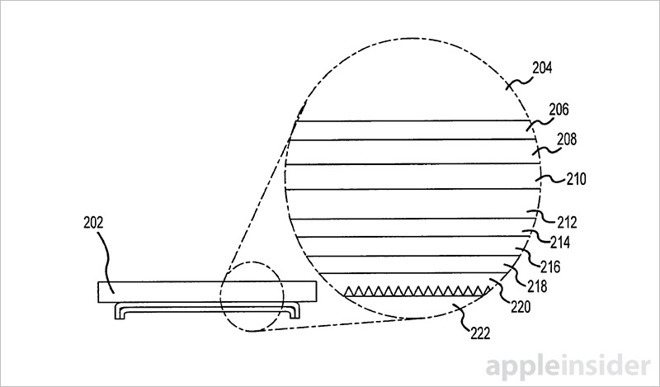 Apple's ultrasonic force sensor patent was first applied for in June 2015 and credits Brian Q. Huppi, Martin P. Grunthaner, John G. Elias, Sinan Filiz and Steven P. Hotelling as its inventors.